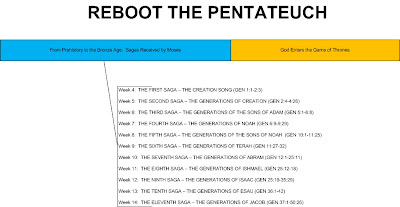 This is Part 7 of 20 in a series about the Pentateuch, the first five books of the Bible. In it we will explore the context of the book, specifically its relationship to the Egyptian culture of its day. This week's will be short to give you guys a breather after last week's very long post. The fifth saga of ancient history that Moses recorded in the Pentateuch was the record of the lives of the sons of Noah--Shem, Ham, and Japheth. Recall that at this time, the entirety of soul-bearing humans besides Noah's family had been wiped off the face of the earth by the Flood. The timing of the Flood is very, very tough to figure out. As we learned earlier in this series, generations in Hebrew genealogies were not complete: generations are left out to make it a memorable length. Furthermore, you have the entire Young Earth-Old Earth debate which plays in dramatically to any questions of timing. For the purposes of this post, I'm going to assume the traditional history of mankind as seen by the archaeologists. Knowing that Hebrew genealogies were incomplete, we therefore cannot rely soly on the works of Moses to date our ancestry. If we make such an assumption, then the rise of man-like creatures (Neanderthals and the like) happens about 200,000 years ago. But nothing really changes...until about 50,000 years ago. At that point, inexplicably to scientsts, man sees a Great Leap Forward. Culture begins. Humans start talking and burying their dead. They start painting and domesticating animals and growing crops and cooking with fire. So I will propose that this event, the Great Leap Forward of about 50,000 BC, was Adam and Eve's explusion from the Garden and into our world. So this was our Second Saga. We can be pretty confident (for reasons we will discover later), that the life of Abram (the seventh Saga) happens sometime around 2000 BC. Third Saga - The Generations of the Sons of Adam: ? 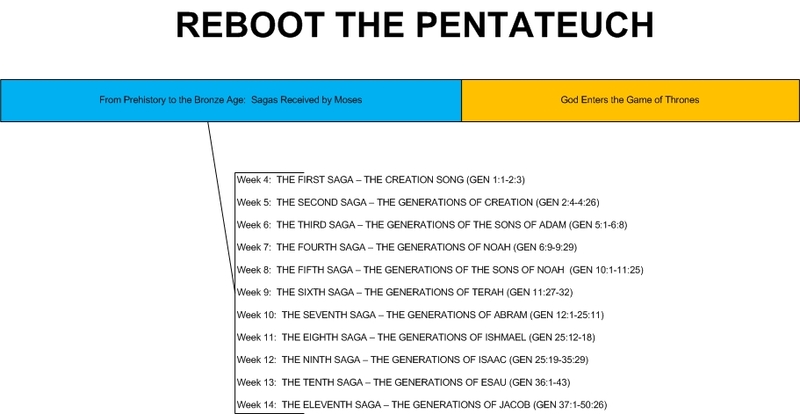 Fourth Saga - The Generations of Noah: ? Fifth Saga - The Generations of Terah: approx ? Archaeologist Robert Ballard has found evidence of a major flood in the region in about 5000 BC, and suggests that this is Noah's Flood. This does make sense chronologically. Fourth Saga - The Generations of Noah: 5,000 BC - ? The point I am trying to make is that each of these Sagas recorded by Moses covers a LONG period of time, with potential major gaps in between them. Christians sometimes state that the purpose of Genesis is to record the history of the world up to the time of Joseph--WRONG. That is very much not the case. Those are the clear goals of Genesis, and we need to read it in that way. That is why long periods of information are skipped. It is frustrating to modern Western readers who wish for an extensive history textbook...but that wasn't the purpose of what is written. So it's no good complaining that God didn't write the book you WISH He had written. So we are probably somewhere in the early Bronze Age here. Becuase of that, I suggest we look into history/archaeology and see what we know about Bronze Age cultures. Roughly speaking, we see the clans descended from Japheth spread north and west out of Mesopotamia, becoming known as sea-traders. This makes Japheth the origin of the majority of the Europeans and Aegean cultures. This fits archaeologically, as the Mediterranean became a booming seafaring area in the early Bronze Age. Interestingly, the tribe known as the Sea Peoples included a group called the Teresh, very similar to the Tiras listed in Gen 10:2 as a seafaring descendent of Japheth. The descendents of Ham are called the great city builders. This too fits archaeologically, as the great cities of Sumeria and Egypt began to be built in the early Bronze Age (approx 3000-2000 BC). The typical large city held about 10,000 people at this time. The descendents of Ham seem to have stayed mostly in Mesopotamia but also spreading southwest into Africa. Meanwhile, the descendents of Shem head to the "east" (from Mesopotamia)...likely meaning India and Asia. Again...do not get confused by their genealogical methods. I know that it is tempting to read these passages as "complete" genealogies, and the long lifespans of the pre-Flood people makes that possible. But in this section, such false beliefs are rightly destroyed. People only live 120 years in this passage(recall that from Genesis 6), so these people are not fathering more than 6-7 children each. We have listed from Genesis 10:1-18 only about two dozen people...but several large cities! Moses likely never expected any confusion on this point. After all, NOBODY kept complete genealogical records...at the time of the sons of Noah there was no way to write. They couldn't remember everyone's name. Moses in fact does not even record individual names here--he is listing countries and people-groups: Cush, Egypt, Canaan, Sheba. Remember that this passage gets us from Noah's three sons to all the tribes and cultures of the day, including many nations (10:5)...and they did it all with hundred-year maximum lifespans. They didn't father hundreds of thousands of people in four generations. So Genesis 10 tells us in very high level pictures where the known peoples came from, and all traced back to Noah. The point being...all are descended from Adam and Eve, even though they have different nations and genealogies. The story of Babel is recorded in Genesis 11:1-9. We know that these events happened before the spreading out of the last chapter (11:1), and that the very first city built by the sons of Cush was Babel (10:10), founded under the leadership of the great warrior Nimrod (10:8-9). Somewhere in Mesopotamia they built a large tower, with the attempt of gaining honor as the greatest in the land. God is displeased, and therefore confuses their languages and begins the spreading-out process we saw in Genesis 10. Most people see this as a quaint little story. But there is much more "between the lines" here, which Moses and his readers would have caught but we didn't. We don't know how long exactly had passed since Noah, but it is hundreds of years at least, and his family had grown to several thousand people. All of his descendents are still living in Mesopotamia and were numerous enough that they decided to build a city with a massive tower. Their reason for doing so is to "make a name for ourselves." Now in the ancient world, your name and reputation was a FAMILY name and reputation. Even today, many cultures continue to report their family names first, with their given names being last. And this was the family of Noah, saved by God. They owed God the honor for their actions. We read this story today and shrug it off as hubris; the ancients would have been horrified by it. For here we have a group of people wanting to do some action which will be to elevate themselves and their honor by taking away from the honor of God and Noah. They are seen as usurpers, stealing the rightful place of the family and community. So God disperses them all over the face of the earth, beginning the process of Genesis 10's spreading. The last part of our Scripture today, Genesis 11:10-26, is the proverbial nail in the coffin for those who believe that Genesis genealogies should be taken as literal, complete records of history. Here we see more of the same from Genesis 4, right? People live 400 or 500 years before they have sons and daughters, and the genealogy from Shem to Terah is recorded. All of this happens after the Flood and after Babel. Yeah, there's just one problem, isn't there? Do you see it? Way back before the Flood, in Genesis 6:3, God said, "[man's] days shall be 120 years." And yet, here in Genesis 11, we see people who just start having kids at 100, and live 500 years after having them! 1. God was wrong in Genesis 6:3. Oops! So much for omniscience and omnipotence. 3. We accept the overwhelming record of archaelogy that ancient genealogies are NOT complete, and were never INTENDED to be read as complete. I propose #3, obviously. When you read that Shem fathered Arpachshad after 100 years and lived 500 years after, having more sons and daughters...this does not mean God was wrong in Genesis 6:3! It means that the TRIBE of Shem gave rise to the TRIBE of Arpachshad after 100 years, and the TRIBE of Shem continued for another 500 years, creating new tribes and spreading throughout the Earth. The INDIVIDUAL of Shem lived no more than 120 years (and probably much less), as God stated clearly in Genesis 6:3. Some of you reading this won't like it. I'm sorry...your beef is not with me, but with Moses. Take it up with him one day when you're both in the New Kingdom.